Universal footmuff-baby blanket with hood and vents for Group 0 infant car seats and Prams. The Mims+ foormuff is suitable for Group 0 carrycots and infant baby car seats with vents for the harnesses to go through. Universal design, suitable for Pushchairs, Carrycots, cribs and baby cots. Soft stretchy cotton fabric with warm, comfortable padding and cosy fleece inner fabric. 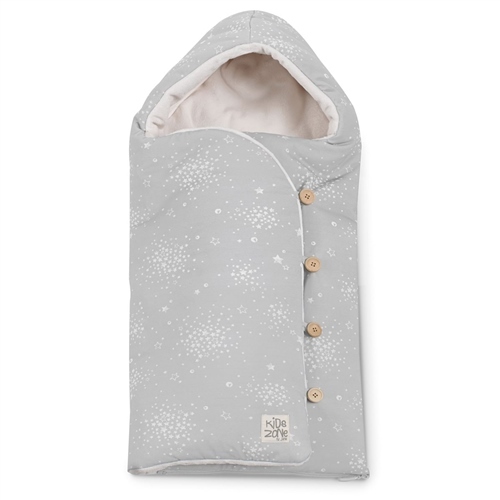 With buttons (or Velcro) to open it down one side and a zip at the foot end to keep the baby covered and prevent cold air from getting in. Newer model is fitted with a hood to protect the baby’s head from the cold without reducing his angle of vision. Dimensions: 44 x 90 cm.